The wxWidnows library is one of the best open source libraries for developing cross-platform user interface. Its API for event handling simplifies embedding a scripting language for widget creation. You may have noticed that in the reference the function push() is registered to the base window; therefore if we want to push a event-handling callback function to handle menu event in the main frame, we have to cast the frame from the top window type to the base window type. Here are more examples. 2) add label and text box to the sizer. 2) add check boxes to the sizer. 3) add combo box to the sizer. 4) add radio buttons to the sizer. 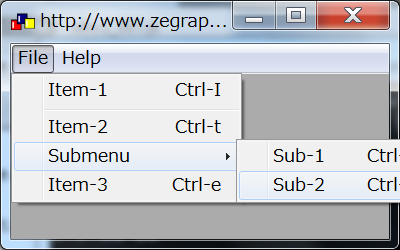 create a grid sizer in the top sizer and add controls in it. // all objects are accessible.